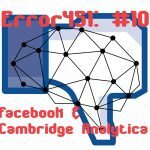 This week on Error451, William Budington and Bursts chat about the Facebook and Cambridge Analytica scandal. We’ve seen Congressional hearings and M. Zuckerburg give testimony, we’ve seen punditry, we’ve seen evasion. For the episode, the two chat about what’s going on with the hullabaloo and different solutions privacy advocates have proposed.